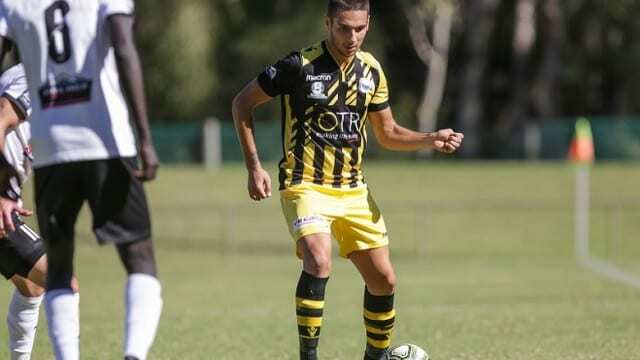 The Birkalla Senior team are ‘keeping the faith’ according to Oliver Zafiridis, who has shared his thoughts on Sunday’s 3-2 loss to league leaders, Campbelltown City. “After the game on Sunday we were shattered,” he said. “Everyone worked so hard and to give away a 2-goal lead in the first half was very unfortunate. “Obviously everyone feels that we don’t deserve to be where we are on the ladder but that is how it stands, so we just have to deal with it in these last 5 games. “For the situation we are in and how the season has panned out for us, we’ve just constantly taken it game by game without looking too far ahead. Sunday began with a goal from Will Plush in the 3rd minute of the match, followed by a successful strike from Dylan D’Agostino at the 11-minute mark. Unfortunately for Birkalla, in-form side Campbelltown responded with their own successful shots at 33 minutes, 38 minutes and again at the 44-minute mark to seal the win. Zafiridis says despite the result, his side takes positives from the match. “We know that Campbelltown are a high-quality team and top of the league for a reason,” he said. “We matched them on and off the ball with a goalless second half and all of us really felt like at least a draw would’ve been fair. “Moments proved the quality we have as a unit so we will continue to stick together like we have, stay positive, train hard and work hard and we all still believe things will turn. But first, Round 18. A home game against Para Hills Knights who currently sit 8th on the ladder, 4 points ahead of Birkalla. Para Hills are also coming off a loss in Round 17, a 3-1 result against Adelaide Comets. “Looking at Para Hills, we know that it is a mini grand final for us, as is every week now until we finish the year,” said Zafiridis. “They’ve picked up a few good wins throughout the year and we know that they’ll fight hard right to the end so it’s not going to be an easy game at all. “I think what will be looked at most from Sunday’s game will be just keeping that high intensity effort as a whole and not losing our concentration in important moments during the game. “Everyone in the club has been as positive as we can and training hasn’t dropped off one bit, so continuing with this attitude and some fine tuning will get us a long way to winning on the weekend and climbing up the ladder to finish the year strongly. Support your Birkalla on Sunday in Round 18 at The Parks Football Centre. Under 18’s kick-off 11am, Reserves 1pm, Seniors 3pm.